The Incarnation of our Lord Jesus Christ is pivotal to our Faith and is the most powerful demonstration of what it means to provide for the needs of others who find themselves in exile, away from their rightful homelands. As humans, we were all victims of the separation from God caused by the weakness of our humanity, and through the Incarnation and Salvation, were restored to our rightful place in Him. When God took flesh, He experienced our pain by sharing in it and not merely observing our situation from a distance. Having said that, the Incarnation of our Lord was not only intended to make humanity feel comfortable in the world (John 17:14-15), but to provide a safe and viable route back to its rightful original place in His Kingdom. Likewise, we must also feel the pain of those suffering, share their burden, and provide for the immediate humanitarian needs of the vulnerable who are both internally and externally displaced. Our longer-term vision must then be to restore them, if that is their desire, to the lands they have occupied for generations, and in which their heritage and identity lies; a restoration that is founded upon dignity, equality, safety and prosperity. The idea of providing this means of return is by no means prescriptive, but is based upon the same concept of our Lord having provided us with a viable way to reach His Kingdom through Salvation, but leaving that desire and its related choices to every individual. We must then continue to work towards safeguarding the dignity of every person we encounter, and to call for the basic God-given rights owed to the countless millions living in unenviable positions of displacement or exile. We must also do all we can to provide for those in greatest need of our support, for in doing so we live the message of the Incarnate Lord, extending our hand and offering ourselves as ministers of His message of hope, light and love (Matthew 5:14). 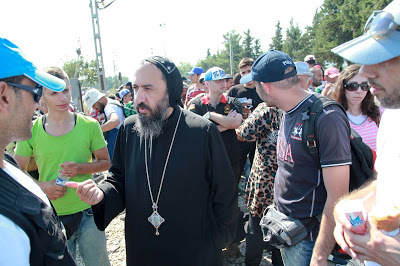 0 Comment(s) to the "A safe passage: a Christian response to the plight of refugees and displaced peoples, Article by HG Bishop Angaelos"